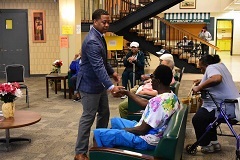 Gubernatorial candidate Mahlon Mitchell hosts a roundtable on criminal justice reform and visits the Clinton Rose Senior Center in Milwaukee on Monday. MILWAUKEE - Yesterday was a day of hard conversations. 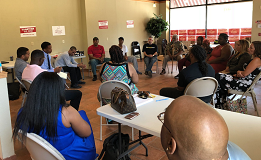 Our tour brought us to Milwaukee, where I hosted a roundtable on criminal justice reform -- an issue deeply personal to many folks in that city and around our state. We know that an incarcerated Wisconsin is not a productive Wisconsin. My Administration will look beyond incarceration and invest in opportunity in our vulnerable communities and work to foster a criminal justice system that focuses on rehabilitation and successful re-entry. But first, we have to listen. I need you to enact true reform -- you, your ideas and your experiences. I’m here to listen and take action. Next, I was welcomed by the community at Clinton Rose Senior Center where residents voiced their concerns about access to health care and other essential services and the rising cost of prescription pills. Medicaid pays for premiums, copays, and drug costs but the single most important way Medicaid helps seniors is by covering long-term care or nursing home costs. By not taking Medicaid expansion dollars we are putting the lives of older Wisconsinites at risk. Our seniors deserve the best care and access to services they can get. We ended the day with President Trump’s announcement of Brett Kavanaugh's nomination to the Supreme Court. The stakes of the 2018 midterm election cycle can not be more dire. Wisconsin cannot count on Scott Walker’s cronyism, corruption, and incompetence to protect the rights of the over 5.7 million Wisconsinites. We need a Governor that will stand up for a woman’s right to choose, our families' right to fair and equal pay, and our right to healthcare -- no matter what comes out of the Supreme Court. Yes, these conversations -- about badly needed reforms to our criminal justice system, about rising health care costs, about dangerous changes to the Supreme Court -- are difficult. But with all hands working, we can rise together and move forward, no matter what.